Results of scientific research show that Ha Long Bay features ecosystems of a tropical ocean region such as ecosystem of coral reefs with 232 species of coral distributed mainly in the areas of Cong Do and Bo Hung. It is also home to 81 species of gastropoda, 130 species of bivalvia, 55 species of polycheta and 57 species of crab. The ecosystem of salt water-flooded forests chiefly concentrated in the zones of Tuan Chau, Cua Luc and Ba Che has the most diversified collection of species of salt water-flooded plant in North Viet Nam. Also living in this ecosystem are a great many species of animals: migrating birds (200 species), polycheta (169 species), seaweed (91 species), reptile (10 species). Ha Long Bay also has ecosystem of tropical rain forests with various rare and precious creatures: deer, weasels, squirrels and in particular, white-tabby and red-haired monkeys. In addition, there is a system of small caves along the sea, which are the living and development places for many animals and plants: seaweed, water plant, algae, fish and shrimp. Deeper into the water, there are also many species of shrimp, fish, abalone and other sea-specialities. Ha Long Bay was also listed as one of new seven nature wonders of the world by New7Wonders Organization in 2011. 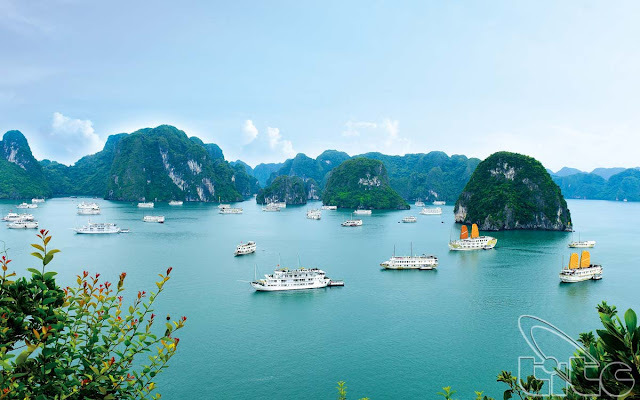 The visitors exploring Ha Long Bay are treated to one of the true wonders of the world, enjoy interesting experience with kayaking, and take an overnight cruise on a tradition junk around the bay.